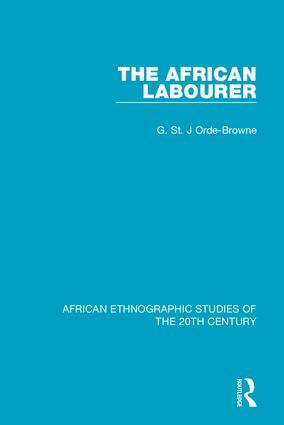 Originally published in 1933, this book is a comparative study of the labour market in the early part of the twentieth century in different parts of Africa. It focusses particularly on the impact of Western influence, both on an industrial and sociological level, in the period after the First World War. The book takes as its area central and southern parts of Africa, as well as the West Coast. Part 2. Summary of Legislation. List of African Countries Dealt with in the following summary of legislation. The Belgian Congo. British Colonies, Protectorates and Mandated Territories. French Colonies. Italian Somaliland and Eritrea. Liberia. Portuguese Colonies. Spanish Colonies.